The Ogawa Family, together with the Red Cross, is challenging donors to donate for Japan disaster relief. Every tax deductible dollar you donate, the Ogawa family will match equally in contributions to the Red Cross up to $500,000. Together we can donate One Million Dollars to the Red Cross. They were only at 14% of the goal when we donated on Monday, and now they’re almost halfway there with 17 more days remaining. Please give what you can! And now back to your regularly scheduled blog post. 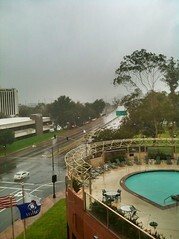 Here’s a view of the storm from our 4th floor hotel room. A HUGE eucalyptus branch blew down into that intersection a little while later! 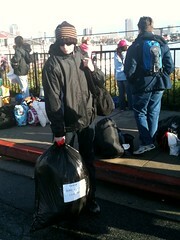 Got Henry to the dock on time the next morning and he got on the ferry boat and sailed away. And then I drove up to Long Beach yesterday (Friday) to fetch him. I left at 11am, though I didn’t need to be there until 2:45, because last year I left at noon and was an hour late because of traffic. But traffic was easy yesterday and I got there at 1pm, so I found a free parking lot and knitted while I waited. It was so wonderful to see him again! We never go a whole day without talking or emailing or texting, so five days felt like an eternity to me :) While we drove, he told me about all the fun stuff he did all week — nighttime snorkeling, a 15-mile hike, a visit to an old mine, kayaking, etc. I’m so glad he had such a great time! What a wonderful opportunity! 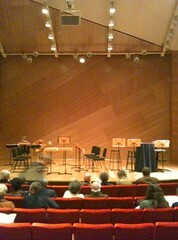 Last night Mom, Chloe, Henry, and I went to UCSD to hear a concert. It was Bach’s Sonata in G Minor for Viola da Gamba and Harpsichord (played on modern viola), and Stravinsky’s “L’Histoire du Soldat” and it was just marvelous from beginning to end. Embarrassing as it is to say, I haven’t been to a proper classical music concert in years, I guess… I’d forgotten how amazing it is to hear real live musicians. 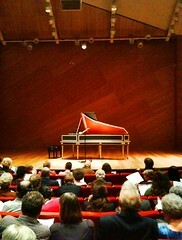 The viola and harpsichord piece was just as lovely as you might imagine. The viola was rich and velvety, and the harpsichord had none of that nasally sound they can sometimes get. And it was Bach. What more do I need to say? The audience loved it and wouldn’t stop clapping so the musicians had to come back for three curtain calls! Also, no one clapped during the movements, thank goodness. I’m always nervous about that. But the audience was mostly old people and university music students so I guess they knew how to behave. Then there was intermission, and the crew whisked away the harpsichord and brought in the chairs and stands for the Stravinsky piece. “L’Histoire du Soldat” is an interesting and unusual piece (written in 1918, I think) and is played by a septet of woodwinds, strings, brass, and percussion, with a story which is read by a Narrator, a Soldier, and the Devil. The conductor was excellent. I love to watch a good conductor. The part of the Narrator was read by a dapper Englishman in evening dress, the Soldier was read by Seth Lerer (more about him further down), and the Devil was read by a dark-haired woman who reminded me of Lily Tomlin’s “Edith Ann” character. All three were perfect. Marvelous piece!!! My favorite bit is the second little piece, the “Airs by a Stream”, but it’s all fantastic. The bass player broke a string about five minutes in, so he ran away to find a new string, and then they started the whole thing over. I’ve never seen that happen before. Oh, yeah, Seth Lerer! I’ve been listening to his lecture series on “The History of the English Language” for years, and I recently got his “Life and Writings of Geoffrey Chaucer” which is as good as it sounds. I also have his book “Inventing English” and I’m looking for a hardback copy of his “Children’s Literature: A Reader’s History from Aesop to Harry Potter”. His voice is like the voice of an old friend, so seeing and hearing him perform live was amazing! It turns out he’s the Dean of Arts and Humanities at UCSD. I had no idea! After the concert we found the door to the backstage area and I bravely marched in and found him, and asked if he’d sign my copy of “Inventing English”! 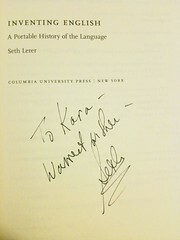 He was very sweet and friendly, and signed my book “To Kara – Warmest wishes – Seth”. Squeal! I guess I’m a linguistics fangirl. Hilarious. I scanned the whole “Santa’s Christmas Village” book yesterday. The book is a lot larger than the scanner bed in both dimensions, so it took quite a while to make sure I’d scanned all the parts of all the buildings. Most of the buildings will need to be printed in several parts on 8.5×11 paper, so I need to do a lot of work on the images to make sure there is enough overlap for gluing the pieces together, and that it’s clear which roof goes with which house, etc. I printed out a test lady on Dan’s nice photo paper and she looks great! Does anyone know how much margin I should leave on each page so that the average printer will be able to print the whole image without reducing it? 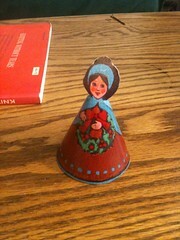 Update December 7, 2011: Want to make your own Christmas Village? You can download my scans here: http://www.archive.org/details/SantasChristmasVillage ! When I was six (1975) I had this wonderful book, “Santa’s Christmas Village”, which contained a punch-out-and-assemble Christmas village. It made a huge impression on me and I’ve never forgotten it — the bright, shiny colors; the feel of the heavy, glossy paper; the embossed details; the faces of the little cone-shaped women; the fun of slotting the little buildings together… But what I did forget was the actual title and publisher. 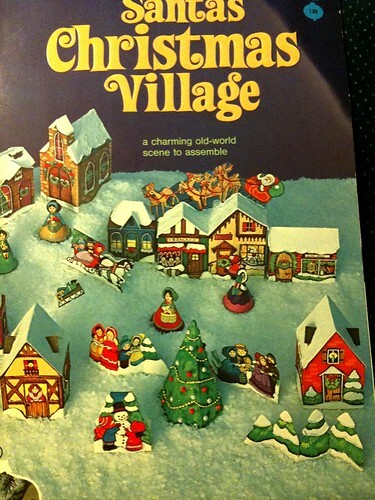 When The Internet arrived, I remembered my little Christmas Village one day and started searching to see if it still existed, perhaps in a retro-reprint or something. I wasn’t unhealthily obsessed or anything — I mean, I would maybe remember and have a little search once a year or so. Since I didn’t know the title, I searched on strings like “cut-and-make christmas town” or “papercraft christmas village” and never had any luck at all. Last week it occurred to me that it might have been a PUNCH-OUT-and-make town, not cut-and-make. That gave me some new results, and somehow I found what sounded like my book mentioned on an antique site somewhere. “Santa’s Christmas Village” (Published by Whitman in 1975.) So I started searching on THAT string, and found an original edition for sale on etsy for $4 including shipping. (I’m sure that link will break pretty soon.) The seller had posted enough photos that I was 99% sure that it was my book. UN-freaking-believable. So I bought it, and chewed my nails waiting for it to arrive. I’m going to scan it and print on heavy paper so I can make my little Christmas Village next December without spoiling the original book. I asked my little sister if she remembered it (we each had a copy so we wouldn’t fight), and she does, even though she must have been only four at the time! So I’ll print a copy for her, too. She says my internet-fu is strong! Oh, internet. Thank you. And thank you, Etsy seller AdaJane! 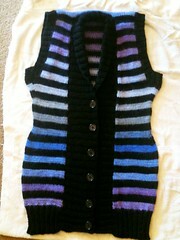 I wanted to knit Mom something very special for her birthday (it was in January, heheh) so together we planned a vest. It’ll be long, v-neck, button up, and striped. 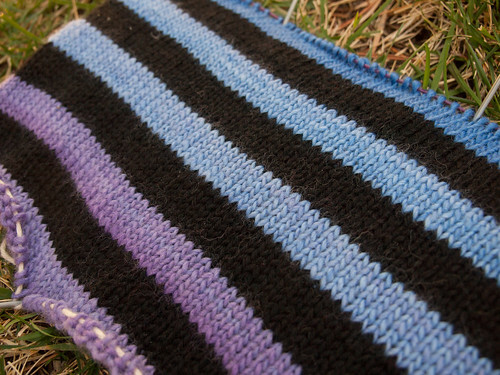 I’m using Knitpicks’ gorgeous new Chroma Worsted in the “Midwinter” colorway, with stripes of black Wool of the Andes. The Chroma is SOFT. Soft, soft, soft. And beautiful! But it seems very delicate; although it does have 20% nylon mixed in for strength, it has almost no twist at all, so it’s almost like knitting with a strand of unspun fleece. I wouldn’t recommend it for socks, but for anything else worn next to the skin it would be perfect. I’m inventing the pattern of course, and working bottom-up for a change because I wanted to establish the stripes before I had to deal with armholes and neck shaping. I’m working from all three balls of Chroma at once (two rows from each, then six rows of black), having first evened them out so that they were all at the same point in the color transitions. 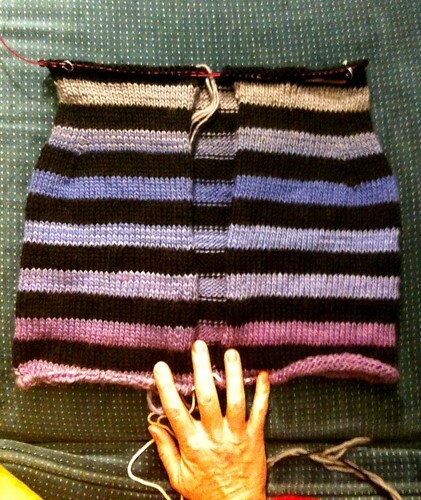 I’m planning to steek the armholes, if I can get up the courage and if I’m POSITIVE the fit is correct. Henry is already feeling a lot better, hooray! His fever is gone and he has a lot more energy. Still coughing but not so much. It’s so wonderful to see him smile again. I felt really tired today so I hope I’m not getting it! We’ll see. I’ve stayed as far away from him as I can and have been washing my hands like crazy. Oh, my laptop went to Apple for repairs for the 7248th time (it has an intermittent screen flicker), and it came back this morning. So far, so good – not a single flicker all day. Time will tell… This is its second new motherboard! It has also had a new display, a new optical drive (for a problem unrelated to the flickering issue), and I think a couple of other new things. I kinda lost track. Oh, a new battery also, because its original battery swelled up. I felt quite good today and it was sunny and warmer so I worked in my little garden in the morning. 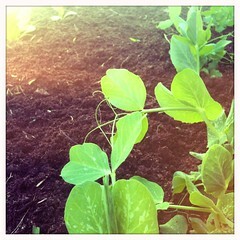 I weeded the peas-and-lettuce bed and thinned out the lettuce seedlings, and then I planted tomato seeds in a pot. It’s still pretty cold at night, and most days, so I sliced the bottom off of translucent plastic jug and popped it over the seeds as a little greenhouse. Oh, I also planted thyme and oregano in a pot. Poor Henry is very sick, sicker than usual with a fever and a very bad cough, so I took him to the doctor and she said it’s probably bronchitis. She ordered a chest x-ray to be sure it wasn’t anything serious, and it came back clear, so that’s good. So he’s on antibiotics now. She also prescribed some cough syrup but he hates it because he still has the urge to cough but he can’t. I read Lord of the Rings to him for ages tonight to help him get to sleep. Poor boy! I hope you feel better soon, sweetie!